For a weekend break I would highly recommend Cardiff. The city is modern and with the huge amounts of money put into the regeneration of the city really shows. Although you still get a mixture of the old history coming through especially as the beautiful castle sits right in the center. Shopping is some of the best I have come across. Every shop I have wanted was there and as it is by London standards a small city, this does not reflect in the quality of shops. 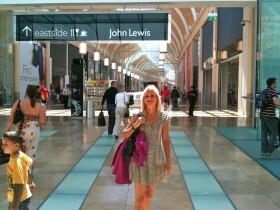 In fact I much preferred it to London, as I felt some of the shops in London are just too pompous. The city is very welcoming, it has the air of freshness to it that makes it unusual. We spent a full Saturday shopping and did not at any point feel crowded. Restaurants abound, and I mean very good eateries. We had a real job deciding which ones we would try and we have a list to try next time we visit. Jamie Oliver’s we felt we had to try this one as we both like Italian food and it did not disappoint us. It has a real buzz to it and had a very cliché, cosmopolitan feel to it. Huge hams hung from the center point, mountains of fresh bread stacked against serving points and the staff were quick and attentive. We found the menu exciting, having a seat at which we could watch the food being prepared, while on the other side we could watch the cocktails being prepared and served. It was not as expensive as we thought. I the food was really good, although to be honest, I had risotto which was very different from my own and lacked flavour,relying too much on the parmesan. I felt my own is better that was the only let down. Would we go back? Yes most certainly, the desserts are to die for. We love these restaurants and have ate at them before. We had breakfast on Saturday morning, the quality never fails. John had pancetta with scrambled eggs and ceps, I tried them and wow! I had croissant’s, Italian toast with a lovely fruity spread. The only reason we did not go back later in the day was that we felt there were so many culinary choices, we felt we had to try, the only negative I would say is that for an evening meal it feels a little like a cafe instead of restaurant, which is a real shame as the food is wonderful. Hotels, well as you would expect their are lots of top hotels to choose from. We wanted one that was half way between the city and the bay area so we chose the Novotel and we are so pleased we did. The Novotel also has it’s own swimming pool and gym which is something we like when we are away, generally speaking though this is a modern well designed hotel, with excellent staff who do try to please. We had the experience of being upgraded to a suite, this really made our visit special, the hotel also gave us late check out which meant we could stay there till 5.00pm the next day, that again made a huge difference. The rooms are well designed highly functional and if you pay a little more you get nice touches like bose ipod sound systems and nespresso machines, bathrooms are very well thought out with great showers. I would recommend the hotel to anyone wanting a good location.